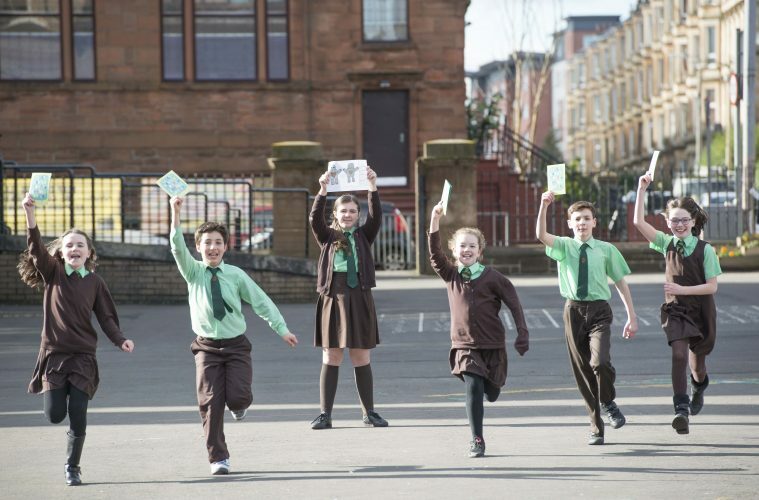 Pupils from St. Denis Primary School in Dennistoun, Glasgow celebrate their awards for the Dickson Pharmacy competition to design a robot named “ Buddy Bot “ which has been installed in Dickson Pharmacy in Bridgeton to speed up dispensing. The pupils left to right with their Amazon gift vouchers are ( left to right ) Kayla Eadie, Mohamed Fadil, Holly Smith the overall winner of the competition, Rhianna Campbell, Reuben Gizzi and Eve Boyce. A local schoolgirl has won a £100 Amazon voucher for her depiction of the new Dickson Chemist robot dispenser as ‘Buddy Bot. Five other pupils from St Denis’ Primary School, as well as five pupils from Dalmarnock Primary School, Dunn Street, all won runner up prizes of a £10 Amazon voucher. Holly Smith, who is in Primary 7 at St Denis’ Primary School, Roselea Drive, won the vouchers as part of a competition run by the award-winning, family owned pharmacy group to name the new robotic system. The Glasgow based company has installed a German-engineered Rowa Vmax robot, an industry leading technology designed to revolutionise the dispensing and storage of medicines. The system works by high-speed scanning of the barcodes, and directing the prescription to the correct destination. This removes any possibility of human error, and vastly increases the speed at which prescriptions are dispensed, reducing patients’ waiting time. Nadine Miller, Operations Manager at the Bridgeton Practice, said: “We wanted to get the children involved in naming the robot, to show that robots aren’t scary, and to show them the fun that can be had. The new system has been installed as part of a full scale refurbishment of the Bridgeton practice; which included moving the consultancy room, and a total remodel of the counter and frontage, making the practice more open and inviting. The Dickson Group has already installed robotic technology at its Rutherglen practice. It is also investing heavily in home delivery pharmacy services, in accordance with the direction of travel in the NHS which is encouraging more home-based care across the UK. The group, which was opened in Tollcross in Glasgow more than 30 years ago, now has five NHS pharmacies and one specialist private pharmacy.